The LR4 is an amazing combination of technical innovations, including breakthroughs in optical design, electronics design, mechanical design, and thermal management. The core of the innovation is a new way to generate white light with LEDs. The technology is elegantly simple, yet incredibly effective. It delivers high efficacy light with beautiful, warm color characteristics by mixing the light from yellow and red LEDs. This approach enables active color management that maintains tight color consistency over the life of the product. Ensuring the long life of an LED product depends on effectively controlling the operating temperature of the LEDs. The LR4 was designed to utilize all components to effectively transfer heat and keep the maximum LED temperature at or below acceptable levels-even its worst-case environment. The LR4 optical system improves upon the desirable aesthetic of a smooth aperture appearance. Cree technology enables a light source and reflected image that are smoother and more uniform than possible with incandescent or compact fluorescent. 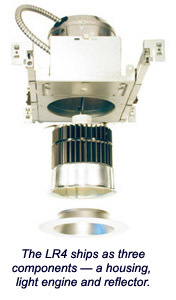 This means that LR4 downlight integrates cleanly with architecture and deliver crisp and clean light scallops on vertical surfaces that are free of distracting striations or hotspots.